Philips Lifeline medical alert has one of the best reputations in the medical alert industry, and with good reason. They invented the industry, have been around for over 40 years, have served millions of customers and get referrals from over 200,000 nurses and doctors – more than any other medical alert service provider today. We believe Philips Lifeline offers the best all in one mobile medical medical alert device, the Go Safe 2. In one small, light and nice looking pendent you get the 2 way speaker, help button, GPS and automatic fall detection. Most other companies require you to carry the mobile help button separately from the mobile GPS and speaker device. Some even require to carry around a third device for fall detection - which is very inconvenient and bulky. That said, if all you're looking for is an in-home medical alert system, we think there are better alternatives to Philips Lifeline. However, if you're looking for a system to protect you in and outside the home, none come with better, more convenient hardware. 1. 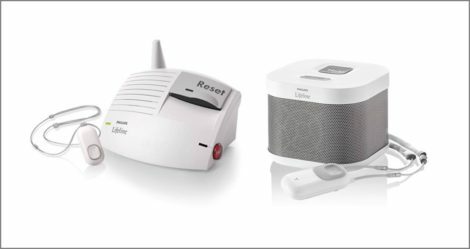 Serviced Installation: Philips Lifeline is one of the few medical alert system providers that have local technicians that can come to your home and install your system for you. While most landline systems are no harder to install than a phone line, if you or your loved need help and don’t have anyone who can help you, this is a great service. 2. 100% Water Proof: Philips Lifeline emergency buttons are 100% waterproof. You can wear them in the bath, shower or swimming pool for as long as you want. This is in sharp contrast to most other devices which are water resistant up to 3 feet of water for 30 minutes of exposure at a time. Not a significant issue for most, but for those who spend a lot of time in the water, it’s the right device for you. 3. Fall Detection: 3 out of 10 seniors who fall can’t push their emergency button for help. Every second counts. Long lie times can lead to serious injury and complications. The Auto Alert fall detection pendant is built with SMART sensors that can detect your fall and will call the Lifeline response center automatically – without the need to press the button. Philips Lifeline’s automatic fall detector has been endorsed by the American Geriatrics Society, American Physical Therapy Association and National Council on Aging Falls Free Coalition. Fall detection is a significant benefit to all those at risk of falling, not just older adults. Beneficiaries might include those with low blood pressure, diabetes, arthritis, vision impairment, COPD and/or medications that cause drowsiness or confusion. 4. National Coverage: Unlike some local medical response providers, Philips Lifeline offers national coverage and allows you to change locations. Whether you travel, vacation or have multiple residences you can take your Philips Lifeline with you. Simply notify Philips Lifeline in advance and test your system once it’s plugged into the jack at your new location. 5. Very Fast Response Times: Philips Lifeline offers 24X7 monitoring, with company owned monitoring centers in the U.S. and Canada. The average wait time is just 22 seconds, and Philips Lifeline’s redundant technologies means it has 99.999% availability – it never goes down. 6. High Level of Staff Training: Perhaps more than any other company, Philips Lifeline is reputed to have some of the best trained staff in the industry. Philips Lifeline owns its own monitoring centers and hires its own staff giving it complete quality control. Each associate gets 80 hours of training in gerontology and has their calls monitored at least once a month for ongoing training. The average monitoring center employee has been with Lifeline for 7 years – with low turnover comes better training, service and quality. 8. Deal Terms: Philips Lifeline is doing a lot to stay competitive in the marketplace. Its basic HomeSafe monthly service only costs $29.95 a month, and it comes with one pendant or wrist watch. However, Lifeline charges an additional $50 activation fee plus $19.95 for shipping or $99 if you choose to have the system installed. In most cases those activation and shipping fees will be waived, if you call and ask. Unfortunately, most of Lifeline’s competitors, like Medical Guardian and Bay Alarm Medical do not charge any shipping or activation fees – ever. Moreover, many providers will also provide an additional pendant or lock box at no additional cost, something Philips Lifeline might also want to consider. You can cancel your month-to-month subscription plan at any time, with no penalty fee, giving you quite a bit of flexibility. However, many providers are now offering a free trial period so users can see whether they like the system before they commit any dollars to it – we’d like to see the same from Lifeline – especially with their significant shipping and activation fees. Our assessment? If you need someone to install an emergency response system in your or your loved one’s home, Philips Lifeline is the best option on the market. Furthermore, if you’re looking for a provider with a long track record of quality service, excellent equipment, trained staff and company owned and managed monitoring centers, Lifeline is hard to beat. That said, if price, value and flexibility are your concerns we strongly believe that there are some great alternatives on the market that can service your needs just as well, while getting more bang for your buck.